I love the countdown to Christmas. Almost more than I love Christmas. I wake up on December 1st almost as excited as when I wake up on the morning of the 25th. This year was extra exciting as I went to the Bieber concert on the 1st. Last year I counted down the final days by sharing some of my favourite scenes from holiday movies. This year I thought I'd start the Christmas Countdown with some of my favourite Christmas songs. Enjoy some Buble while you read the rest of this post. I did some Christmas shopping today and, as is wont to happen, I bought a few little trinkets for myself. One being a new cake pan! 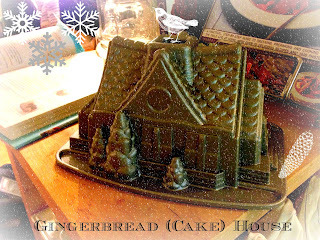 I went a little crazy editing it with picmonkey's holiday themed overlays. I plan to make a gingerbread CAKE house rather than the cookie houses I attempt only to have the walls or roof inevitably collapse in on themselves. Preheat oven to 350 degrees with rack in the lower third of oven. Spray a 9-inch square baking pan with nonstick cooking spray. Line the bottom of the pan with waxed paper, then spray the paper. Dust the entire pan with flour and shake out the excess. In a large bowl, whisk together the flours, turbinado sugar, cinnamon, and salt; set aside. In a medium bowl, whisk together molasses, eggs, oil, and buttermilk. Dissolve baking soda in the cup of boiling water. Fold the baking soda and molasses mixtures into dry ingredients until combined. (Do not overmix.) Fold in the minced ginger. Scrape batter into the prepared baking pan; bake until cake is set around edges and a toothpick inserted in center comes out clean, about 40 minutes. Cool 10 minutes in the pan, then invert onto a cooling rack. Serve warm or at room temperature, dusted with confectioners' sugar. 3 Days Til Christmas: Sugar Cookies Galore! Christmas: 15 days to go!